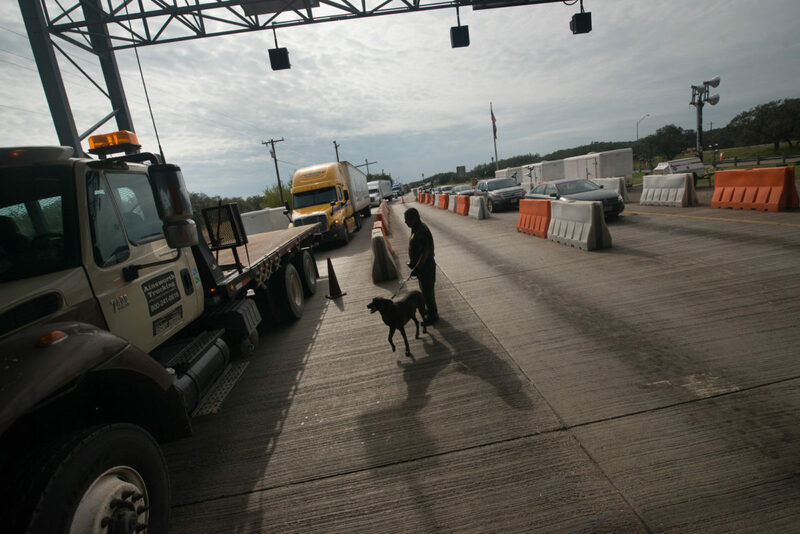 A Border Patrol agent stands with a K9 searching for smuggled illegal immigrants in a lane for tractor trailers at the checkpoint in Falfurrias, TX. 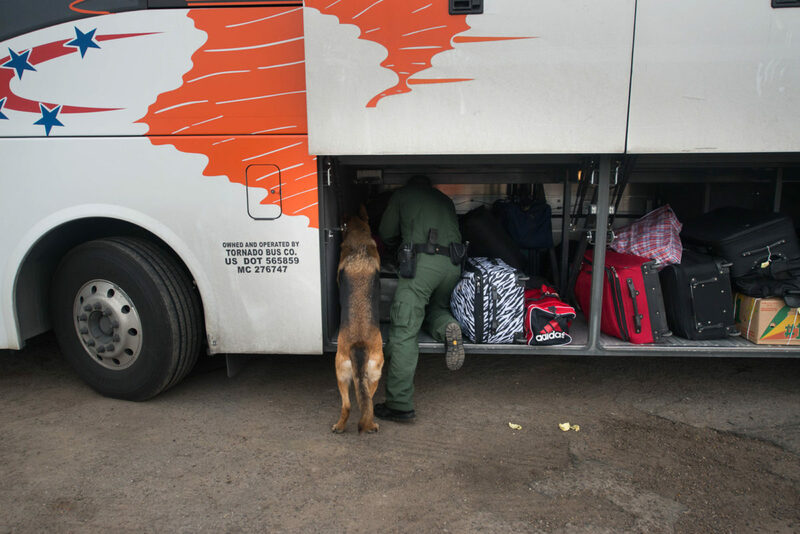 A Border Patrol agent uses a K9 to each a coach bus for suspected drugs at the checkpoint in Falfurrias, Texas. 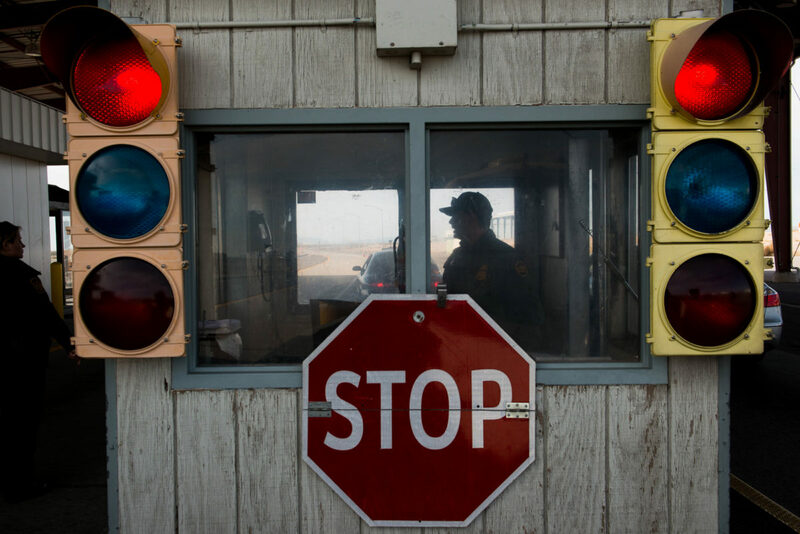 Border Patrol agents at a checkpoint along I-10 west in Las Cruces, N.M.
Hidalgo County Constable Pct. 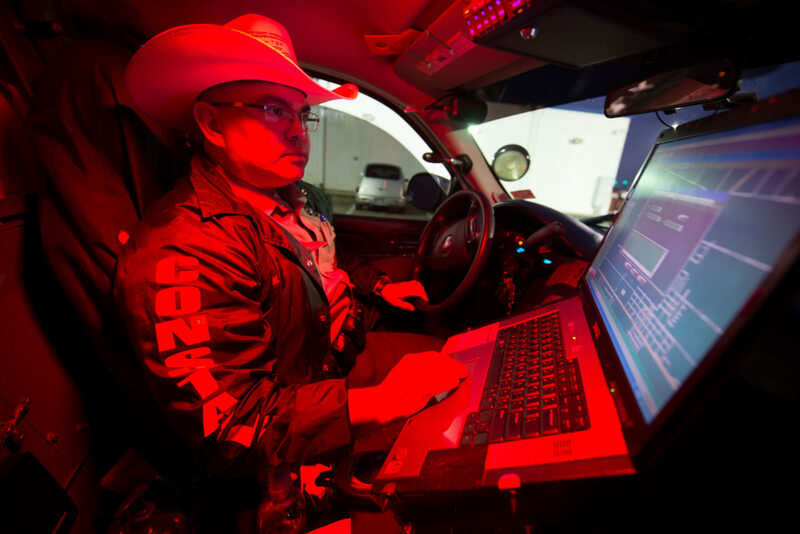 4 Deputy Constable Michael Anzaldua sits in his vehicle during an operation to locate a suspect in a human smuggling case near Edinburg, Texas. 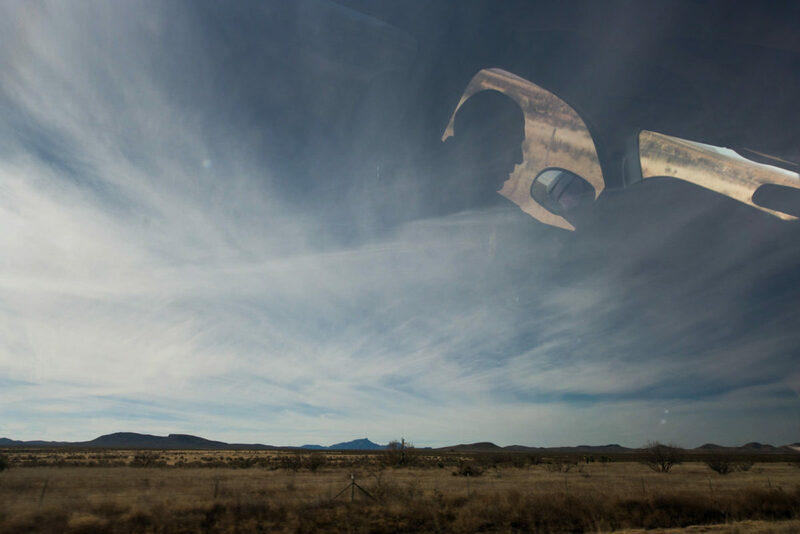 Border Patrol agent Giovanni Cisneros is reflected in the window of his vehicle as he drives near Hachita, N.M.
Hidalgo County Deputy Constable Michael Anzaldua questions the driver of a vehicle, an undocumented alien, who admitted to transporting another undocumented alien to a stash house in Edinburg, Texas. 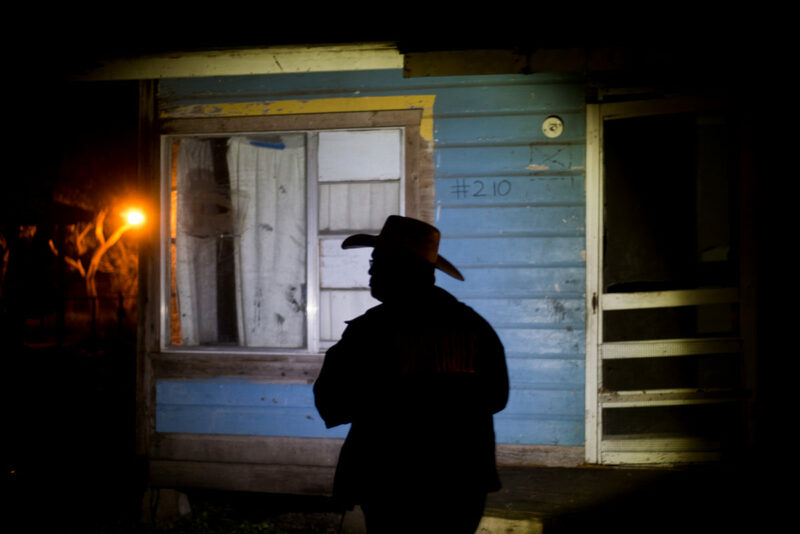 Hidalgo County Deputy Constable Michael Anzaldua assists in a search of a suspected stash house near Edinburg, Texas. 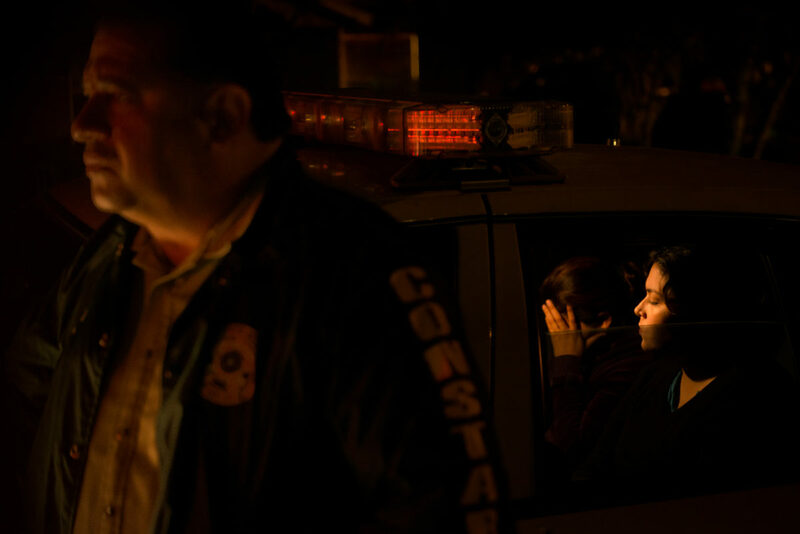 A Hidalgo County Deputy Constable stands near his cruiser with two female illegal immigrants during a raid on a suspected stash house just outside of Edinburg, Texas. 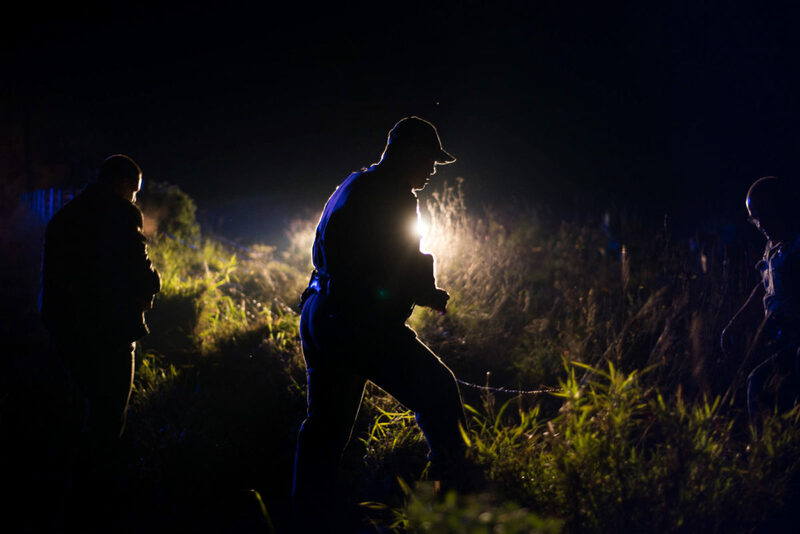 Hidalgo County Deputy Constable Michael Anzaldua searches the area around an abandoned vehicle that drove into the brush after police attempted to pull over the vehicle on Route 281 north of Edinburg, Texas. 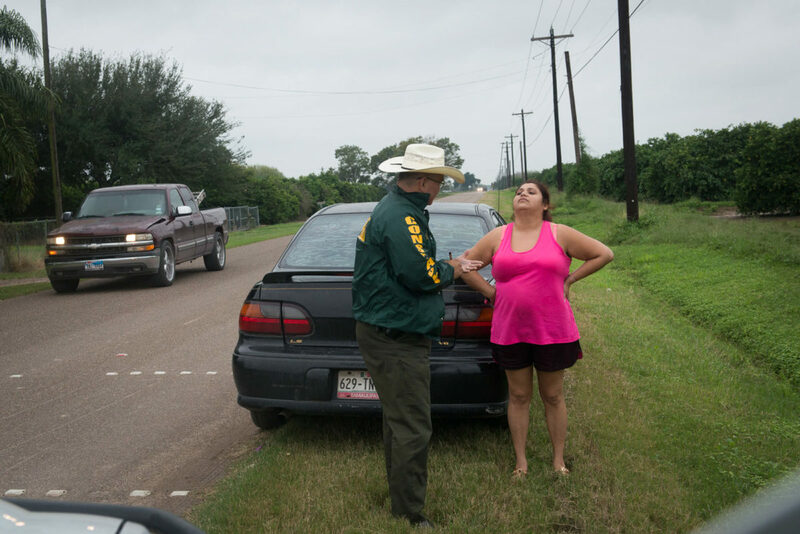 The occupants of the vehicle fled on foot and were later apprehended with the help of Border Patrol. The 2014 Jeep was a rental and had a modified suspension to help carry and conceal transportation of illegal immigrants. 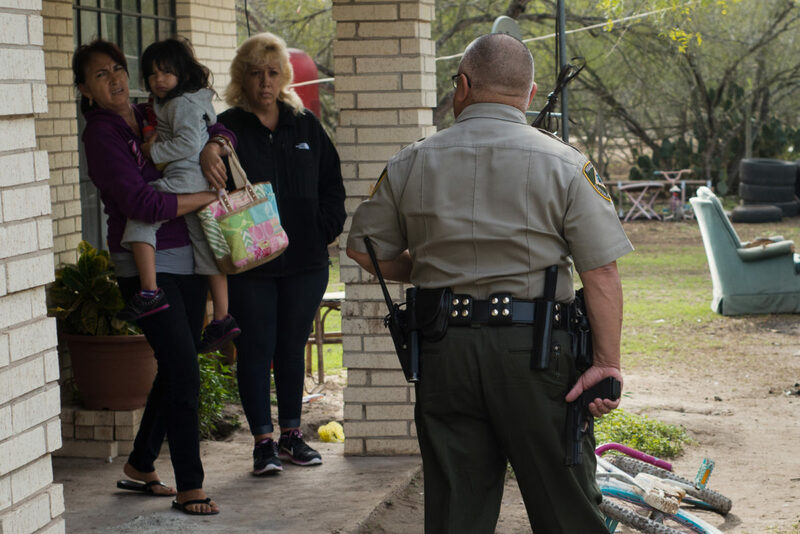 Hidalgo County Deputy Constable Raul Salinas approaches suspected undocumented aliens during a raid on a home in Elsa, Texas. 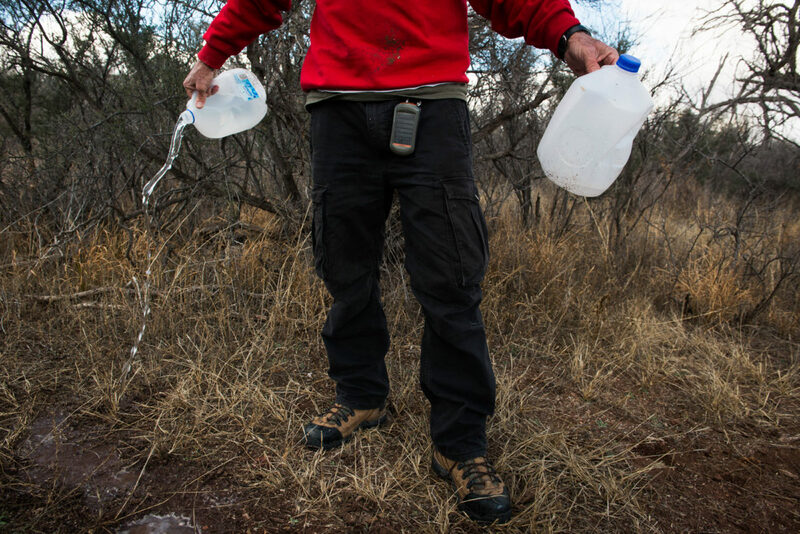 Richard Osburn, 64, of Sahuarita, Ariz, a member of the Green Valley/Sahuarita Samaritans humanitarian group that works with migrants in the desert, empties water bottles that were opened. The humanitarian group leaves water in the desert to place along trails used by undocumented aliens. If bottles are found opened, the remaining water is emptied to protect against any tampering. Dylan Terrazes of Santa Barbara, Calif., touches his grandmother's fingers as she meets him for the first time at Freedom Park in Border Field State Park in Imperial Beach, Calif. 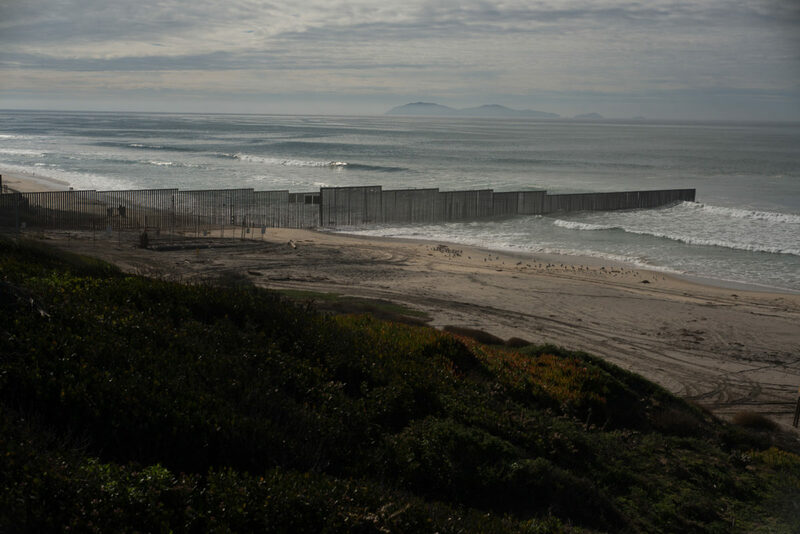 Sitting at the end of the 1,933 miles of U.S. border with Mexico, the Border Patrol allows people to congregate on both side of the fence on weekends. 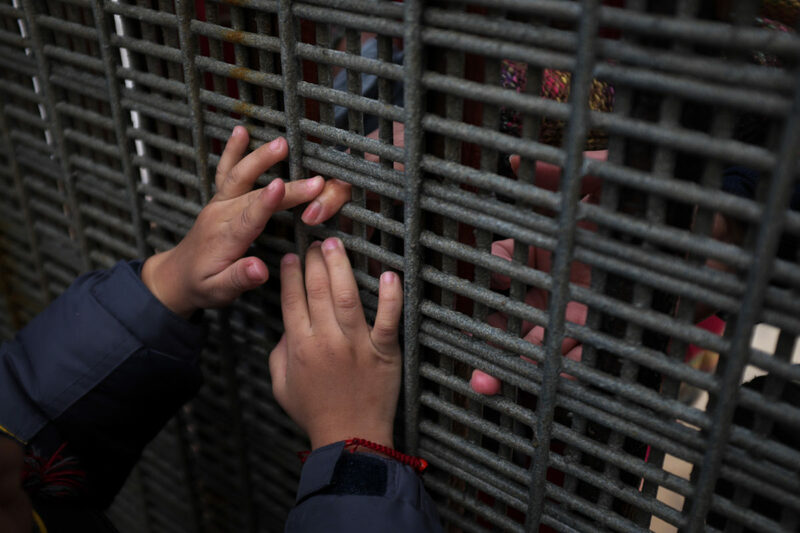 The small holes in the fence leave little room for physical contact through the fence except for fingertips. Those who visit at the park say they give "pinkie kisses" though the fence. 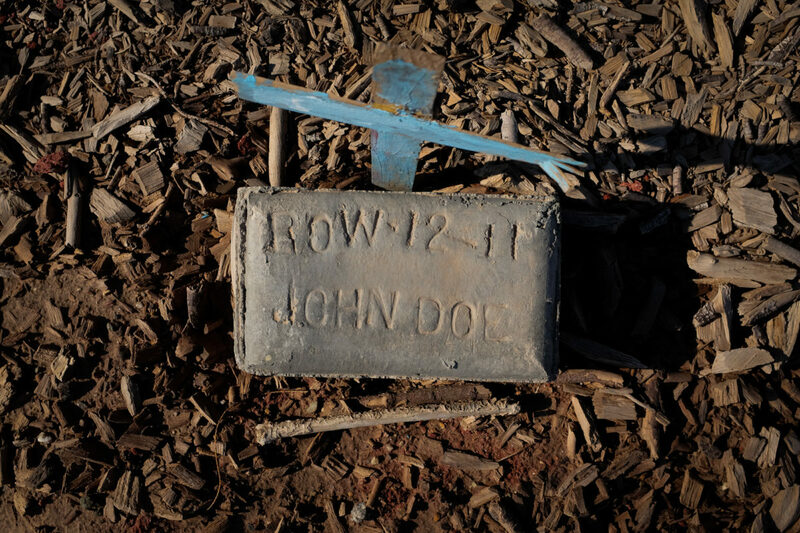 A grave for a undocumented migrant is marked with the name 'John Doe' and a small wooden cross in a section of Terrace Park Cemetery in Holtville, Ca. where unidentified migrants are buried. 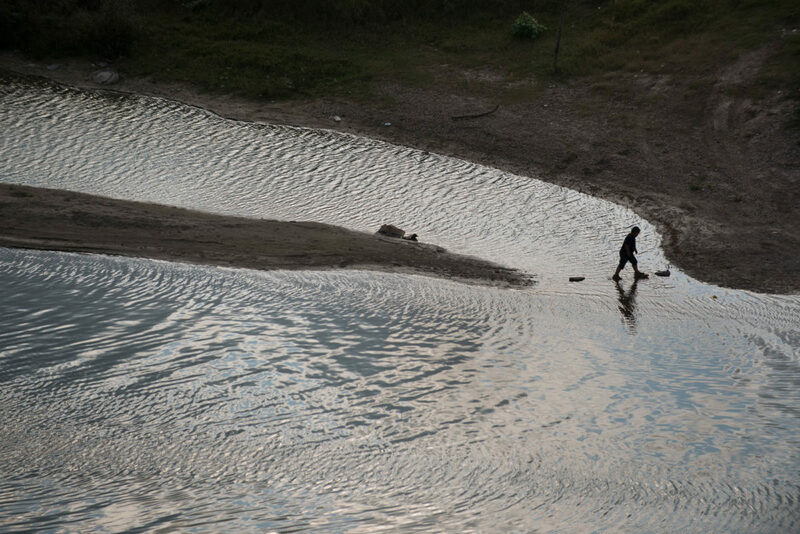 A young boy walks along the Rio Grande River near a popular crossing point for illegal immigrants beneath the bluffs of Roma, Texas. 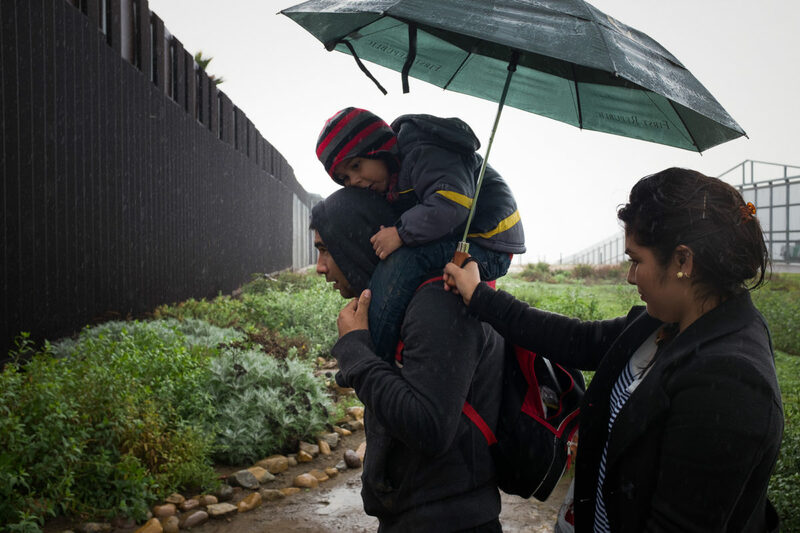 Since the 2001 terrorist attacks, Border Patrol doubled in size to nearly 21,000 agents, all but 3,000 of whom are stationed along the border with Mexico. That’s more than nine agents for every mile of border from Texas to California. 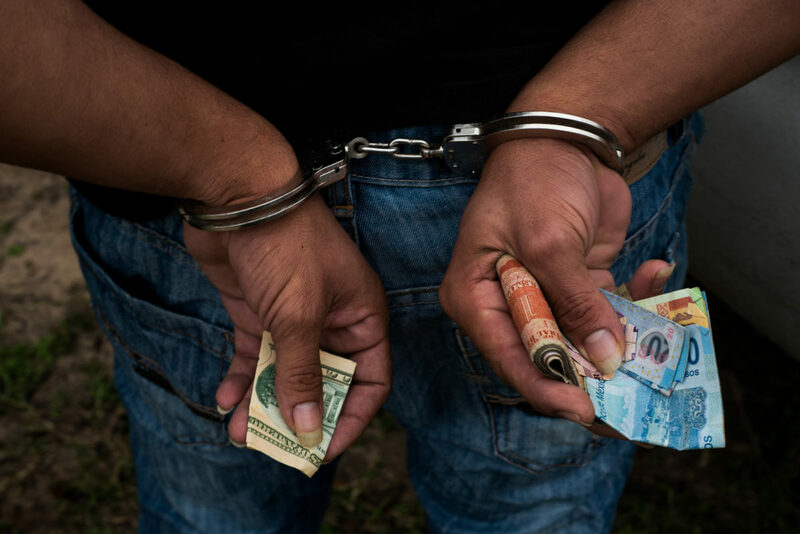 Critics of American immigration policy contend undocumented immigrants are flouting U.S. visa laws to steal jobs, hiking taxpayer costs for medical care and schools. Others argue that immigration can boost the economy and applaud a White House proposal to raise the number of temporary work permits for low-skilled workers who have migrated here without documentation, creating a potential path to citizenship for an estimated 11-12 million people already here. The story above is presented for portfolio purposes only. All rights are reserved by the copyright holder indicated above.